Last year, after several storms of biblical proportions in my area, we went through a long string of days without electricity. Lacking camping equipment, I had to make do with candles in my house. I was astounded by how dark nighttime really is. Electricity has bamboozled those of us who have grown up in the twentieth and twenty-first centuries into believing that evenings aren’t all that different from daytime hours. But the darkness is truly impenetrable once the sun sets. There is a kind of pitch black to which your eyes don’t grow accustomed. Candles can’t stand up to the all-consuming power of it. You need a lot of candles to light the room enough to be able to read, even a little, for example. Of course, in biblical times they did not have candles. They weren’t invented yet. 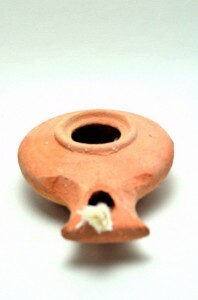 They had lamps, usually made of pottery, with a linen wick, which burned olive or other oil. If they could afford it, they let one lamp burn through the night. To avoid fires, they placed these lamps on lampstands if they could afford one. The common folk simply over-turned a bushel and used that as a lampstand. That’s why Jesus said people don’t light a lamp and put it under a bushel; that lamp gives light to all in the house. (Matthew 5: 14 -16) It would have struck the people living in biblical times as an absurd picture to put your lamp under your bushel basket. In the same way, Jesus says that His followers are the light of the world, and they must burn bright like a lamp that lightens the community around them. thank you I never knew this or at least putting the lamp on the basket part. I always think of candles when I read this passage. thank you for all your research and information to certify things for us. Thanks for this information. It is really helpful when reading scripture. My Bible study group and I are reading through 1 Kings and I’ve been looking for ways to explain the differences of that world and this. Glad to have been of help, Mandy. Great research! I’ll use it for my Bible Study this Sunday. Thanks so much! Can you imagine peter walking on a large deep vast of body of water and having no light other than the light of the world to guide him in the darkness upon the sea. The Lord is so amazing. ©2019 Tessa Afshar, All Rights Reserved.